CM: The Magical Secret of Myrto is a tale by Fotini Tomai-Konstantopoulou, illustrated with paintings by Dimitris Talaganis. The cover of the book is of unique handmade paper adorned with petal-and-leaves on a natural colored sisol base. 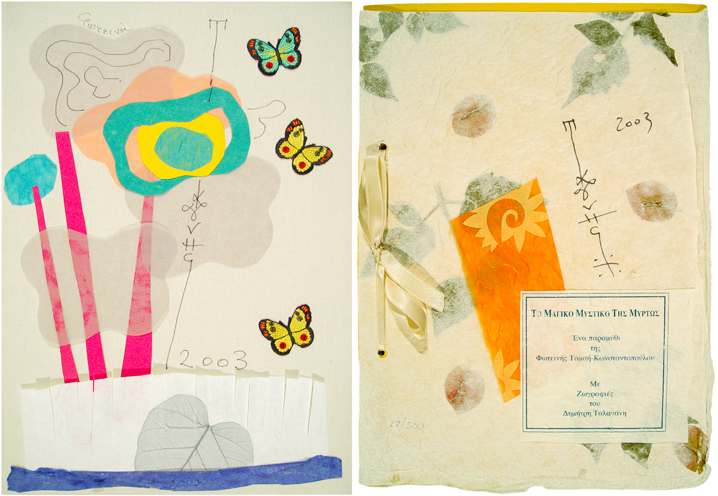 The book itself is set inside a clothbound case decorated with a unique collage by Talaganis. This version no.22 of 500 copies was especially prepared for the ACG Art Collection and presented on 7 September 2005 with a special dedication to the College by Talaganis.